Harvest Moon® is safe for the entire family and comes with a 100% money-back guarantee. 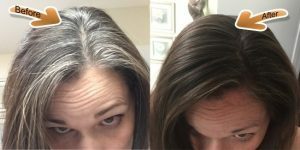 It was developed for gray-haired people that are allergic to chemical hair dye. One pack does bra-length hair and you can mix any colors together to create more colors. Cover the gray the natural way with a one-step process (except jet black in some cases). If you do not use it all, save the rest for later. It works on any hair regardless of the type of hair you have or the color of your skin. It is permanent on most and protects hair. Watch out for copycats! We have had the same customers for well over 10 years. We ship the same day and offer customer service second to none. Please always do a strand test first, this way you will know what color your are getting. Step 2. Mix thick and apply! Step 3. Rinse and enjoy! Harvest Moon® is wonderful for your hair and scalp. The benefits are overwhelming! You owe it to yourself to try Harvest Moon®. It is a natural hair dye made using henna and indigo. It is healthy hair dye. All of Our Dyes are 100% Natural. 1. Henna and indigo make browns, blacks and mahogany colors. Ours is pre-mixed. 2. Pomegranate peel and neutral henna gives a red color. 3. Orange peel, lemon peel, aloe extract dried and indigo give burgundy color. 4. Indigo by itself makes hair a black color, use henna first to create a jet black. Harvest Moon® is the most natural hair dye you can purchase. It works just as good for the beard. If you are using it for the beard, make sure you get the beard dye, as it comes with directions for the beard. Please, always do a test strand first. This way, you will know what color you are getting. Once you find the color you love you will be a henna user for life. Harvest Moon® organic hair dye will settle over a 24-hour period and blends to match your color, covering grey hair. 100 grams will be enough to do mid-back length hair. When in doubt please ask! We are here to help! If you plan to use on eyebrows, please gently wash with shampoo and a tooth-brush prior. Harvest Moon® hair dyes are chemical free and 100% vegan, however, always do a skin test first by placing a small amount on the inside of your elbow for no less than 30 minutes. Harvest Moon is also great for facial hair and body hair.